What is the KR19A Keychain Remote? The KR19A compact remote is one of our customers favorites. It is ultra small and easily fits on a keychain. It has 6 buttons (two sets of On and Off and dimming buttons). 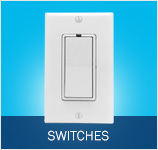 With this unit you can control two different X10 codes (each code can control mutliple devices), you can also dim them! 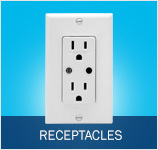 This unit is great for turning on and off lights as you enter and exit your home. Want to turn on a porch light or houselight as you enter? Are you trying to turn off lights as you leave? This unit is perfect for this and you won't lose the remote as it will always be on your keychain. What are the advantages of using the KR19A Keychain Remote? What other products work with the KR19A Keychain Remote? 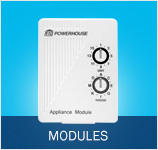 To change the Housecode, simply hold down the (top) ON button for 3 seconds. After the LED light flashes, press and release the (top) ON button the appropriate number of times for the Housecode you want to set. Once for A, twice for B, etc. The LED blinks for each press. X10 Control Kit | MT14A Mini Timer, KR19A Keychain Controller and TM751 Transceiver. Limited Time Deal!